Since 1978, Rmax has been creating insulation solutions based on the latest building science. Our full line of high-quality, polyiso-based wall, roof and specialty insulation products for commercial, industrial and residential applications delivering maximum R-values and minimum environmental impact, with efficiency in installation, cost and design. Rmax insulation has been designed and tested to provide building envelopes with superior insulating protection while meeting the newest codes and requirements. Rmax’s engineered products and solutions allow for ultimate efficiency through multiple design options, creating ease of construction and reduced energy usage. This leads to a better building envelope while adding to the bottom-line through both material and labor savings - making Rmax an excellent choice for commercial and residential applications. As new developments in building science emerge, rest assured that Rmax will remain on the forefront, manufacturing tested, engineered solutions that serve Architects, builders, owners and occupants alike. Our people understand the diverse markets in which our products are used. Their integrity and responsiveness work to your advantage. To educate about ‘Building Longevity and Sustainability’ and how these concepts impact making buildings more energy efficient. The course examines how foil-faced polyiso continuous insulation can function as multiple control layers, providing Air and Water Resistive Barriers, in addition to providing a thermal control layer, and meeting NFPA 285 fire code standards. 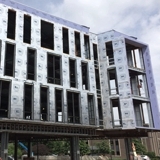 Additionally, the course reviews building codes and standards regarding how to meet the continuous insulation requirements in steel stud building envelope designs, and the benefits of using polyisocyanurate insulation in wall assemblies, and how to specify it to meet these requirements for optimal energy performance and design efficiency.